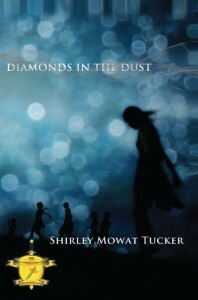 Book Review: “Diamonds in the Dust” by Shirley Mowat Tucker | J.W. Wartick -"Always Have a Reason"
Recently widowed–her husband murdered–and living in fear, Ida Morgan feels utterly alone. Suddenly, a young girl, whom she calls Moses, floats into her life and sets off a series of events that awakens Ida to even more of the horrors of South Africa–horrors often hidden behind the scenes. Ida’s interactions with Moses (and Moses’ siblings) lead her to a fork in the road: she can either confront her fear and help these children, or she can return to her safe, easier life. But Ida is not the only character Shirley Mowat Tucker follows in Diamonds in the Dust, there are her neighbors, whose silver-lined lives may just be a facade; a man with a dark past, trapped by his circumstances; and others. Each character feels real. They each have their flaws, but the reader cannot help but be sucked in by their stories. One tremendous strength of the book is how the reader is shown two worlds. On the one side is the world of Ida and her neighbors, on the other is the world of the children and others. One world needs no hope–it is “normal”; the other world must create hope from the horrible circumstances in which its people seem trapped. Christians looking for a quick, engaging read should pick up Diamonds in the Dust. It will open eyes to the issues of disparity that still exist in South Africa (and elsewhere), and it’s just a plain good read. Disclaimer: I was provided with a review copy of Diamonds in the Dust by the publisher. My thanks to Athanatos Publishing Group for the copy of this book.